Postcard mailed to Mrs. R.B. 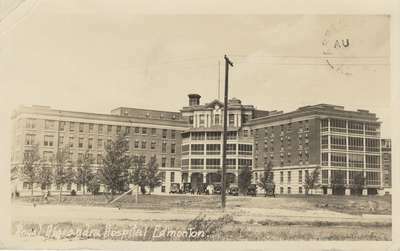 Layton, Lacombe, Alberta, from Eva in Edmonton. This hospital, designed by local architect Roland W. Lines, opened in 1911. Built at at cost of $225,000, it replaced the old Public Hospital on Boyle Street. In 1918 the west wing was added. Had a lovely time at Banff. Took in quite a few of the tours to Lake Louise, etc. and it is a wonderful country. If any mail should have gone to Lacombe for either Harry or myself would you mind forwarding it to Gen. Del., Edmonton, c/o Gebdetic [sic] Survey as we expect to be here for a few days. Suppose you are all at the Lake now, and I hope you have a nice vacation. Harry is going to write to the photographer I think. Love to all the children and yourselves.